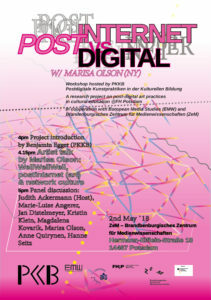 The terms #postinternet and #postdigital try to grasp recent transformations in the ways we live, think and interact. While learning machines densify, simplify and x-ray our life, the discourse tries to examine the trajectories of these developments and their significances for contemporary culture and future subjectivities. Do we learn from the machine, or does the machine learn from us? 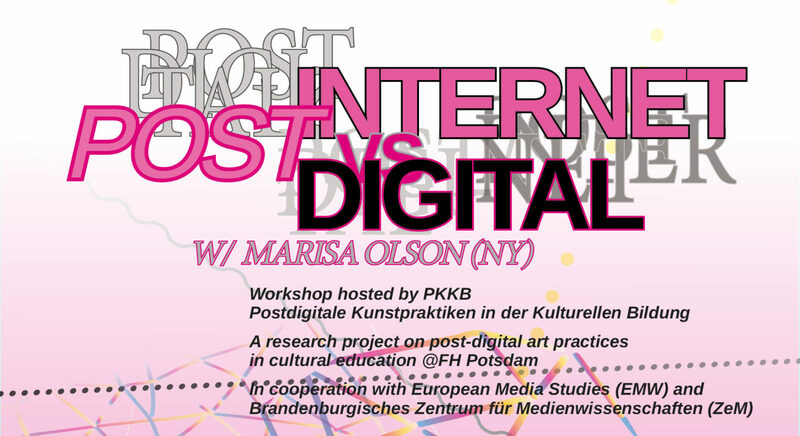 On May 2nd the project PKKB (‘Postdigitale Kunstpraktiken in der Kulturellen Bildung’ / ‘Postdigital Art Practices in Cultural Education’) invites to the workshop ‘Postinternet vs. Postdigital’ to ZeM in the center of Potsdam. NYC based artist Marisa OIson will give a talk about her work, her new project WellWellWell, as well as her personal perspective on the ‘postinternet’ within the arts. In a following panel talk Judith Ackermann, Marie-Luise Angerer, Jan Distelmeyer, Kristin Klein, Magdalena Kovarik, Marisa Olson, Anne Quirynen and Hanne Seitz will discuss about what that means for our society as well as the role of artists, scientists and theorists within it.